Threadbo – get amongst it! Ask people who’ve never been what they associate with Australia, and you’ll hear things like deserts, beaches, surf, kangaroos and crocs. 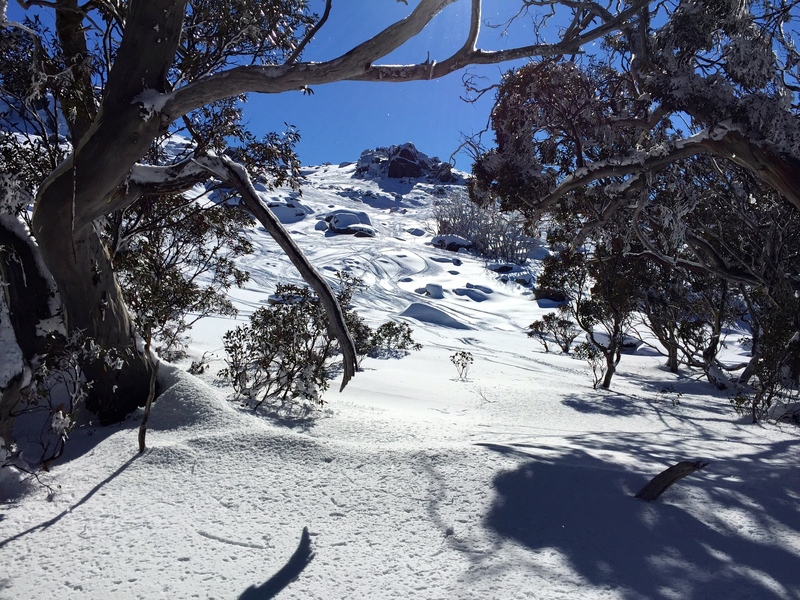 Did you know though that you can ski in Australia? 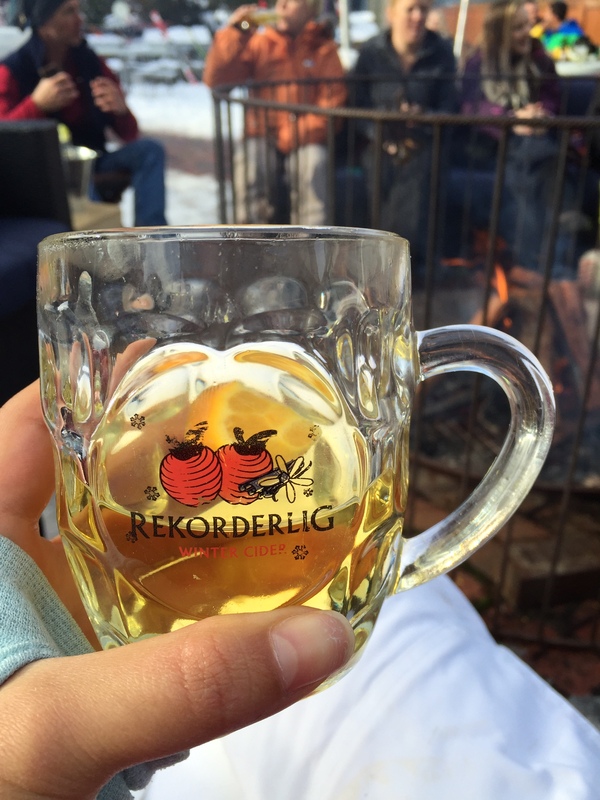 I’m talking real snow, mountains, lifts, boozy hot drinks — the works. If you’re an Aussie local, you may want to skip this post, but if you’re an expat like me, this could blow your mind. Ski holidays are amongst my favourites. Slicing through (and falling in) fresh powder on a bluebird day, wintry nights snuggled up in front of a roaring fire eating calorie bomb bolognese, sipping mulled wine and getting overly competitive at charades with a big group of friends… what’s not to like? When we moved to Sydney a few years ago, ski trips were one of the things we’d reconciled ourselves to giving up trading for the beach. We knew there was decent skiing over in NZ but that seemed nowhere as easy as a roadtrip from NYC to Vermont. Shortly after I started working, a colleague mentioned he was leaving early to drive over to Perisher for a ski weekend. Say what?? Now mind you, this was July in Sydney, a time when the Harbour City is supposedly plunged into the depths of winter (but really it feels like a San Francisco summer). How could there be snow a few hours south, when it’s 20C in Sydney? We missed that year’s Aussie ski season and the one after 😦 But this year, we made it! Last weekend, we drove down to Thredbo. 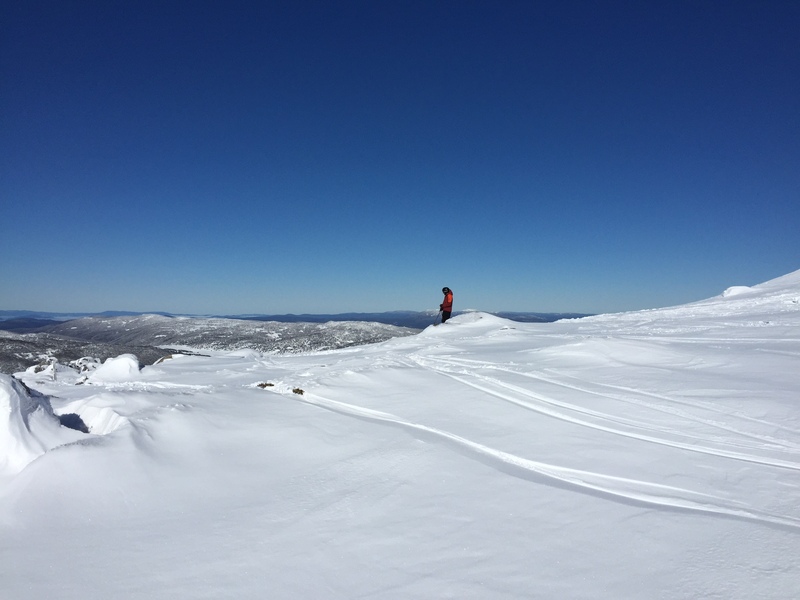 Nestled in the Snowy Mountains of New South Wales, Thredbo is a 500km drive from Sydney and part of Kosciuszko National Park. Now before I get into it, I should clarify that we didn’t have particularly high expectations. Pretty much everyone we knew had told us that “the snow was crap”, that there were “hills not mountains” and that “everything was twice as expensive”. I’ve never skied in the Pocanos but my husband grew up on icy East Coast skiing and had braced himself for man made snow, thin cover and short runs. To our delight, we couldn’t have been more wrong. For starters, we lucked out with the weather. 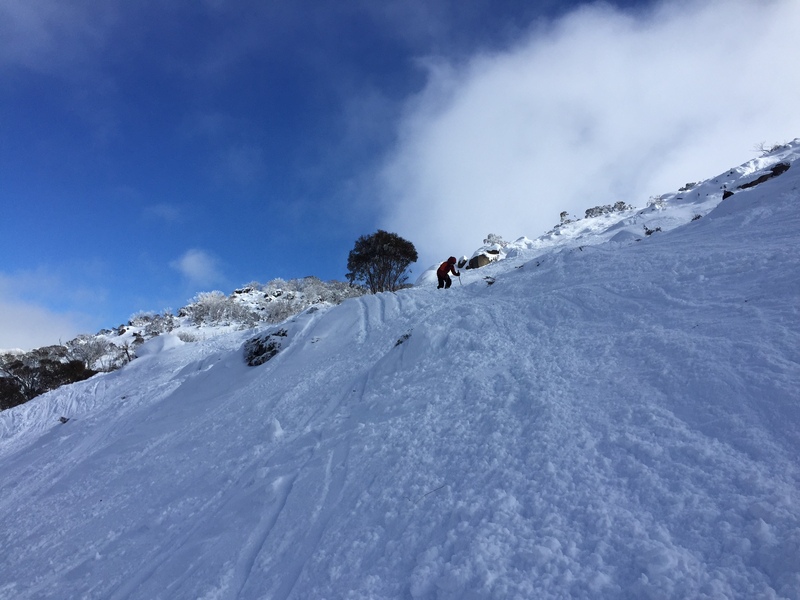 On an average year, Thredbo gets 196cm snow over a 4-5 month season; the night we arrived, the resort was dumped on with 30cm of fresh snow. Yippee! On top of that, we had blue skies, warm temperatures (barely a few degrees below freezing) and plenty of sunshine. Our second day however, they resorted to making snow and the conditions got a little icy. I can see how a snow dry-spell could wreak havoc. This came as another pleasant surprise as we were expecting mostly groomers and some steeps. 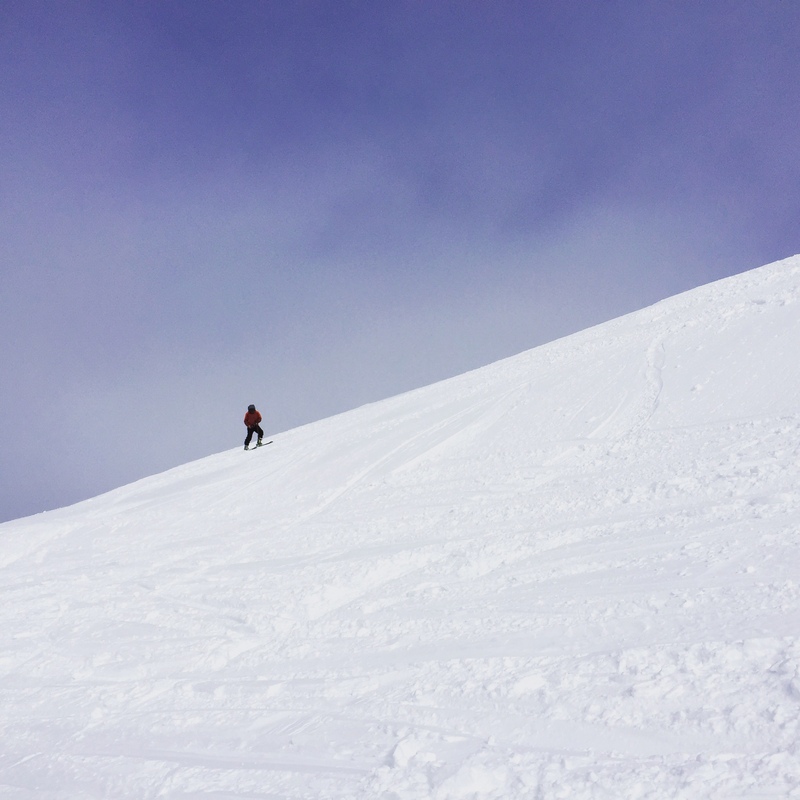 There’s some great tree skiing, lots of rocks and bumps, a terrain park and, if you take Karel’s T Bar to the top of the mountain, you can ski Golf Course Bowl, a gorgeous powdery expanse. Our last run of the day, we made our way down Golf Course through Funnel Web. Not for the faint of heart, Funnel Web is a double black that’s narrow and uneven with rocks and roots poking out the entire way. There are lots of trees, some powder and, at times, you have no option but to take your skis off and walk (crawl?) along the face of the mountain. It took more than an hour to get down and there’s no way I’d go back in poorer conditions / with lower visibility. Thredbo Village is charmingly European — another surprise, although I wasn’t sure what to expect. Kareela, the mountain lunch spot of choice (if you’re happy to splurge) oozes rustic charm and boasts waiters and waitresses dressed in traditional lederhosen and dirndl serving hearty Bavarian fare. One thing that never ceases to amaze me is the Aussie ability to drink, and Thredbo is no exception! In the time that I’d enjoyed my gluhwein and Niraj had had a beer, the three blokes next to us had downed a ski’s worth of shots — 15 to be precise, that’s 5 shots each. A few other tables were splitting a bottle of wine or doing shots themselves, and this was at lunch time, in the middle of the mountain, with a long run to the bottom. It’s a sight worth seeing! 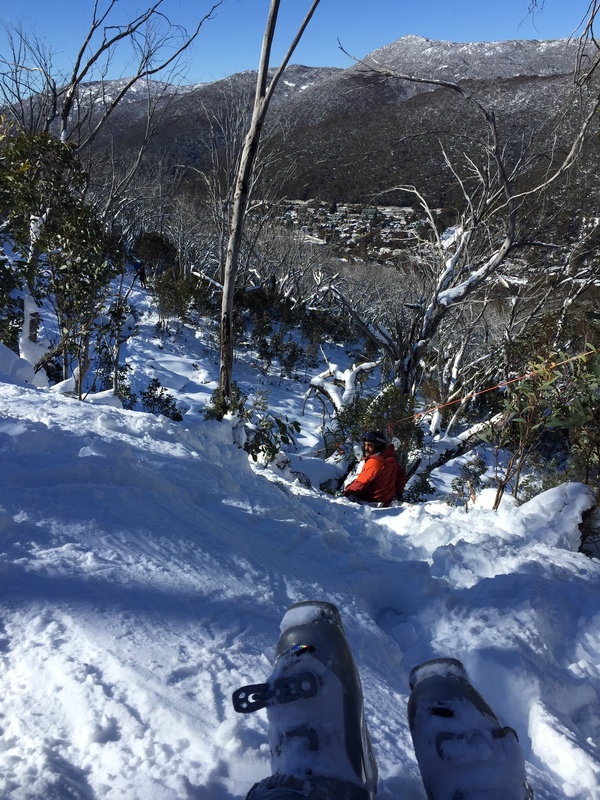 Finally, I was very impressed with the skiers at Thredbo. For a nation with very little snow, the average Aussie skier seems pretty darn good! I suspect it may have something to do with Aussie ski school, which everyone seems to go through. When I learned to ski, I spent three days in ski school and took a couple of lessons after that, but I suspect that’s because I learned as an adult. A lot of my American friends learned to ski pretty much on their own — at most copying a sibling or a friend. It’s harder to nail that perfect form or go nearly as fast without some sort of professional training. The Aussie standard has definitely made me want to step it up! Baking is one of those things I love to do but don’t have nearly enough occasion to do so. 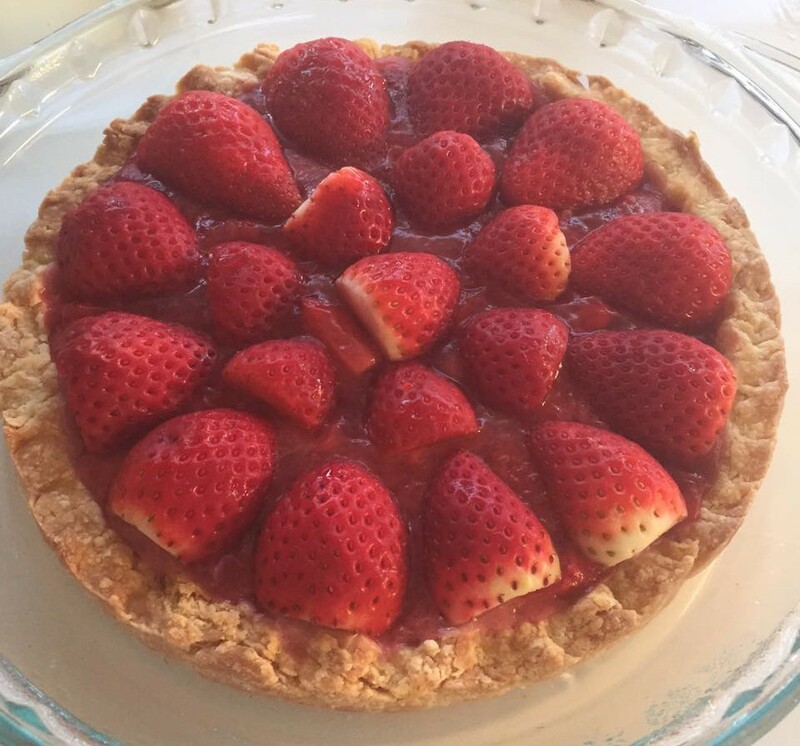 Naturally then, I jumped on our July 4th BBQ as an excuse to bake some pies, more specifically strawberry pies. I’m not much of a dessert person but I’m a sucker for fruit. It’s definitely the one food group I couldn’t live without. And when it comes to fruit, strawberries are up there in my top 5. There’s always a punnet of strawberries in my fridge. This pie is super simple and quick to make. And in the scheme of pies, it’s relatively healthy. 1. Make the dough per my all butter pie crust. Once ready, flatten into a disc, wrap in clingfilm and chill in the fridge for at least 20 minutes. Roll out the chilled dough and place carefully in a 9″ pie dish. You can scallop the edges using your fingers or a fork. Blind bake the shell with pie weights or pennies at 200 C for approx 20 minutes. 2. Toss the quartered strawberries in a saucepan with the sugar and heat on low. Meanwhile, whisk the arrowroot in the water until dissolved. Add to the saucepan and cook on low heat until it reaches a thick, jammy consistency. I like to use arrowroot rather than cornstarch because it gives a gorgeous shiny sheen to fruit fillings as well as a jelly-like consistency. 3. Finally, pour the jammy filling into your baked pie shell and decorate with halved or whole strawberries. Leave to cool and then move to the fridge so it can fully set. Serve with a scoop of vanilla icecream. Growing up in an Indian family in England, yoga was always a familiar and comforting concept. Even though we didn’t practice on a regular basis, we had an innate reverence for yoga’s healing and spiritual benefits. Friends and family back in India often had their own teachers — wizened individuals who’d dress in all white and exude an air of spirituality that made you want to sit up straight and listen. We’d hear stories of how someone’s yoga teacher helped cure an ailment — eye infections, food allergies, even asthma. The Indian yoga teacher is a bit of an institution: someone who bridges generations and brings the family together. Of course, it helps that yoga in this context is typically far less physically demanding than the sort of yoga that’s become en vogue in the West. The focus of these Indian practices would always be breath, mindfulness and flexibility. After an eight year stint in India, I moved back to the UK and had my first real encounter with Western yoga. While working in London, I decided to take a yoga class at the company gym. I was sorely disappointed. Like most gym yoga, this class was uninspiring, repetitive and underwhelming. I never went back, choosing instead to throw myself into traditional cardio. I became an obsessive runner, I swam, I biked, I went to the occasional Les Mills class and began resistance training. Yoga and I were over. In 2008, I moved to New York. and, at the behest of a colleague, gave yoga another try — this time also at our company gym. The instructor was an athletic looking guy who, in quick succession, took us through a series of lunges, squats and extensions, cleverly masked behind Sanskrit names. It was challenging but accessible and I left sweaty and energised. Soon enough I became a yoga addict. It turned out my natural flexibility combined with years of sports made me pretty good at “Western yoga”. I also loved whatever little connection it provided to my Indian roots and would seek out teachers who incorporated meditation into their practice or used the original Sanskrit names for asanas. Ironically, I was almost always the only Indian person in class. 1) The Indian yoga teacher is almost always male. Unlike the West, where we tend to associate yoga with lithe, long-limbed lycra-clad beauties, yoga in India is a man’s world. Think lean, wiry, simply dressed with an often freakish degree of flexibility. The Indian yoga teacher is up there with other family gurus — he’s part fitness instructor, part spiritual coach, part moral counsellor. He is kind yet stern, demanding yet peaceful and he prefers simple white cotton clothing to Lululemon Athletica. While not a religion, Indian yoga is deeply rooted in spirituality and a certain degree of asceticism and self-sacrifice. Yoga takes a far more holistic view in India and students will often eat vegan diets, live simply and engage in extensive meditation alongside their yoga practice. It is less a form of exercise and more a way of life. While certain Western yoga teachers may draw upon meditative practice in class, it’s certainly not the norm. As I mentioned above, the Indian yoga teacher is a highly revered individual. 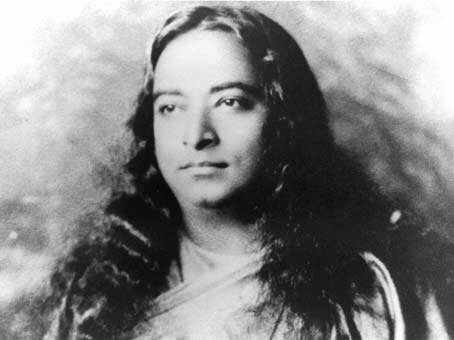 He has not only dedicated his life to the practice and principles of yoga, but commands a level of respect and obedience from his students that is uncommon in the West. The typical Indian yoga teacher will endeavour to educate his students on the history and principles of yoga and the dynamic is more formal. In the West however, the yoga teacher is more often seen as someone teaching an exercise class than a guru or spiritual leader. Indian yoga focuses obsessively on the breath. Once you have the basics down, you progress to various poses, and the emphasis becomes staying and growing in that pose. You’ll often see Indian masters holding pretzel-like poses that make you queasy. Mainstream Western yoga on the other hand, epitomised by the ever popular vinyasa, is more about rapid transitions from one pose to the next and leans more heavily on athleticism and endurance. The idea of “yoga lunges, pushups and squats”, while popular in the West, is alien in India. Western yoga has spawned a whole host of “sects” — forms of physical exercise that are grounded in yoga but deviate considerably from the traditional. Bikram and hot yoga, while popular in the US, are virtually unheard of in India. I recently attended a core fusion yoga class in San Francisco where the instructor had us toting dumbbells and doing crunches and leg raises to the beats of Pitbull. 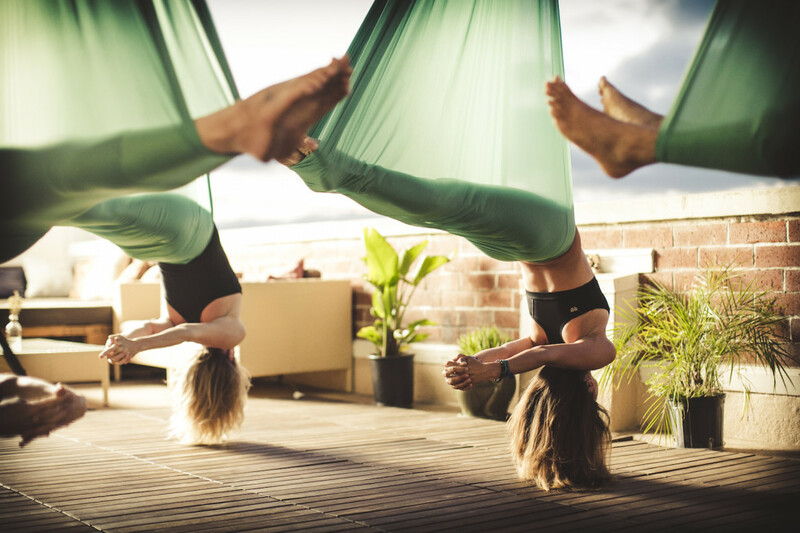 Other emerging forms include anti-gravity yoga and acro-yoga and while these styles might not be for everyone, they have amassed large followings in their own rights. June 21st is International Yoga Day. What’s your favourite kind of yoga? I’ve recently come back from 8 days in Europe, for what will likely be one of my last work-sponsored trips for a while. The company I work at organises events in 10 cities each Spring and, this year I pulled the lucky (or short, depending on how you feel about long haul flights in economy) straw of covering London and Oslo. So off I went. Flying in to London is always emotional for me. 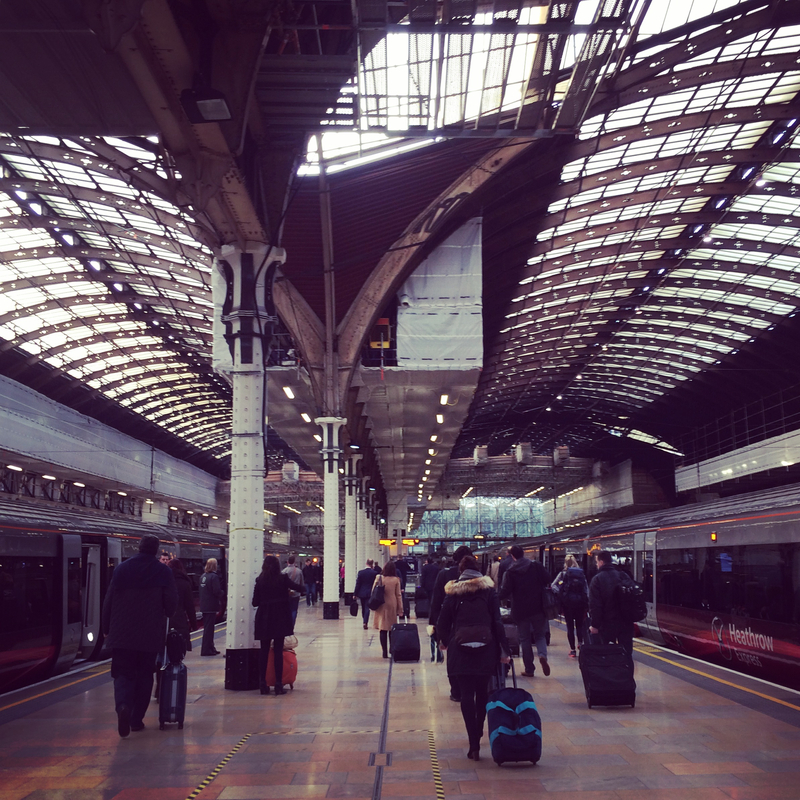 Whether it’s touching down on British tarmac or queuing for the Heathrow Express, there comes a point in my journey when I invariably find myself overwhelmed with feelings more weighty than nostalgia. We moved away from England when I was 12 years old; I moved away a second time when I was 24. Yet after all these years, an increasingly American accent and an address in Sydney, it’s still the UK that feels like “home”. I’ve gone back to London almost every year for the past five years, almost always for work or in transit to some place more exciting. Two of my best friends still live there and I’m never wanting for people to catch up with or things to do. Each time I go back though, I realise how little I really know of London. It’s one of those cities that’s both vast and deep. It has the historical monuments, the architectural marvels, the sprawling parks, the perfectly manicured gardens, the museums, the galleries, the restaurants, the shops, the people…you could spend a decade in this city and not scratch the surface. I’m not sure I could say that about any other place. I suppose though, in some ways, London is a bit like Tokyo: it’s a city straddling the old and the new. It’s trying its best to meet the modern-day demands of a booming urban population against the backdrop (and with the infrastructure) of a practically ancient city. Hey, Tokyo is arguably winning this race, but that’s a debate for another day. Also like Tokyo, London is a walking city. Sure, there’s the tube, but you have to walk to it and in it and out of it. The whole thing can take a while. Unlike New York and Sydney (two other cities that tend to get slapped with the “walking city” moniker), London doesn’t offer many alternatives. Cabs are painfully expensive (although that’s changing with Uber and Hailo) and car owners are kept at bay with congestion charges and non-existent parking. Like many European cities, it’s easy to rack up 10,000 steps in London, and its residents are happy to embrace all the walking and bake it into their travel time. I’m always reminded of my European friends’ penchant for walking when a casual stroll turns into a 2 hour jaunt across the city. Not something you’d do in the US. On this trip, I stayed in two neighbourhoods I’d previously spent little time in: Belsize Park and Waterloo. It wasn’t long before I fell in love with the former. 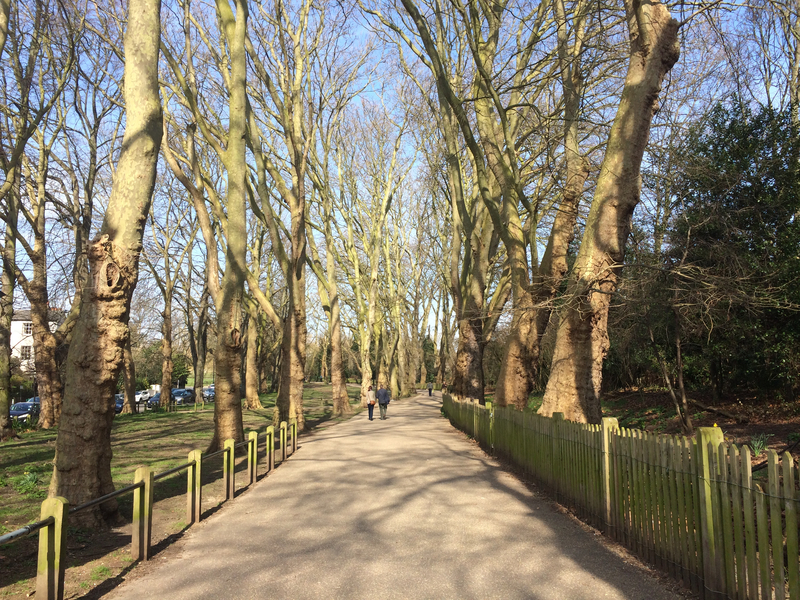 Belsize Park is a gem of an area in North West London, conveniently sandwiched by Hampstead Village in the North and elegant Primrose Hill in the South. I was staying with a friend who’s recently moved to Belsize and, walking around, it felt like I’d been transported to a picture postcard. Beautiful stucco-fronted Victorian buildings sit along leafy streets; flower stalls and butchers add a charming old-timey feel, and boutique shops and artisanal cafés bring the whole thing to life. One of my favourite things about Belsize Park was the utter lack of tourists. It’s hard to get away from the crowds in London without feeling like, well you’ve left all the good stuff behind too, but Belsize Park does a stellar job of juggling both. It’s lively and vibrant, yet it retains that cute, village feel. The other thing I loved about the area was the Heath. 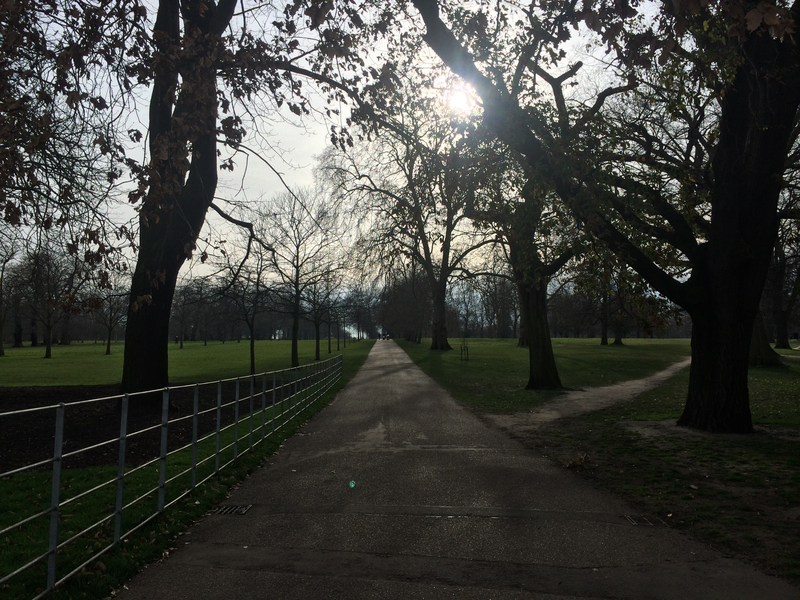 I went for an early jog and was consumed by the stunning views of London in the hazy morning light. My (iPhone) camera died, of course, so I later went back for a stroll and some less romantic pics. I was also impressed by the food on offer. Tuesday night, my friend Neha and I walked over to Hampstead for dinner at Jin Kichi. This tiny, unimposing Japanese izakaya serves up some of the tastiest yakitori and sashimi I’ve ever had. We sat at the bar of course, enabling us to take in all the action and soak in the sights and smells that make the meal so much more of a sensory experience. One bite of the asparagus yakitori and I felt I’d been transported back to Japan! Jin Kichi is a cozy, intimate spot so if you do plan to visit, make sure to book ahead. Its Yelp, TripAdvisor and UrbanSpoon ratings can’t hurt its popularity either. London has always been an international city. Mobs of tourists, hordes of European students, wealthy expats, hopeful immigrants, migrant workers — take your pick, the city has them all. Step out into its busy streets and odds are you’ll hear more than two languages and encounter at least three accents before you reach the tube. What always amazes me, however, is how all of London’s international residents manage to retain their identities while living in what was once the quintessential British city. Move to New York and you’ll become a New Yorker (and in turn, an American). Before long, you’ll be walking faster, planning Super Bowl parties, running after cabs in heels, and contemplating your Halloween outfit months in advance. You’ll “do brunch” and you’ll probably celebrate Thanksgiving (you’ll also have to break it to at least one American that Thanksgiving isn’t a universal thing) and you may well end up leaving your adopted country surprisingly infrequently. Live in London, on the other hand, and you could be exactly who you were when you arrived. You could live in the French neighbourhood, hang out with only French people and visit your French family on a monthly basis. I once had a Moroccan colleague who, after five years in London, had never heard of Guy Fawkes. When I asked why he thought fireworks went up every November 5th, he remarked that it was “some British thing”. To lean on a cliché, if New York is the melting pot, London is the tossed salad — a giant bowl of ingredients, mixed but distinct. London’s diverse population makes for uniquely interesting conversations. Nowhere else in the world have I sat at a dinner table and debated Greece’s economy with a Greek, learned about the Bosnian war from a Sarajevan and planned a Croatian holiday with input from a Dubrovnik native. If your preference is to talk European politics and history, rather than real estate and hot restaurants, this may well be your city. London also wins when it comes to location. The fact that you can jet off to a different European city every weekend isn’t news. It’s been more than 10 years since RyanAir and EasyJet transformed the European travel market with their cheap, no frills services, but the trend is going strong. Wine in Bordeaux, chocolate in Bruges, skiing in Geneva… there’s culture, history, architecture, literature, natural beauty, food and it’s all just a short hop away. The downside (and there always is one), is that living in London means you have to contend with the constant crowds, the heaving tube, the mediocre food (sorry, the bar is still low) and, of course, the exorbitant prices. (I’m not going to pick on the weather because I grew up on, and secretly adore, grey skies.) London has always been an expensive city but over the past decade or so, unbridled demand from overseas investors has driven the property market through the roof and sadly pushed locals farther afield. To make it worse, London salaries, for the most part, haven’t kept pace with the increased cost of living, making it harder to enjoy all of the perks and quirks that the city puts on offer. One of the best things about London is its permanence; come what may, this bastion of culture and history and tradition will stand strong: steadfast, unyielding, unchanged. At times though, it feels like this is the exact thing holding it back. It’ll be interesting to see what happens. Our last meal in Japan was at Sukiyabashi Jiro. It was over one month and three countries ago but the memory of a meal we’ve been lusting after ever since we saw Jiro Dreams of Sushi in 2011 isn’t one that fades easily from memory. Jiro Ono, now 89, has been hailed by the Japanese government as a national treasure and is the oldest chef to have received three Michelin stars. If Jiro and his tiny, 10-person bar in the basement of Ginza station weren’t famous enough already, David Gelb’s epic documentary (which we rewatched before the trip), catapulted the sushi master into the international limelight, making Sukiyabashi Jiro a dream destination for sushi lovers all over the world. Since the meal, a lot of people have asked how it was; if it was the best meal of our lives, whether we met Jiro and, importantly, if it was worth the hype?? I’ll do my best to recount the experience here and tell you what I thought. The solution? Enlist the help of your Japanese friend or colleague or, in our case, your friendly hotel concierge. Get them to start calling early in the day and persist in the face of that pesky busy tone. Lunch is the same price as dinner (¥31,500 or US$260) and the menu is identical, so consider feasting earlier in the day. 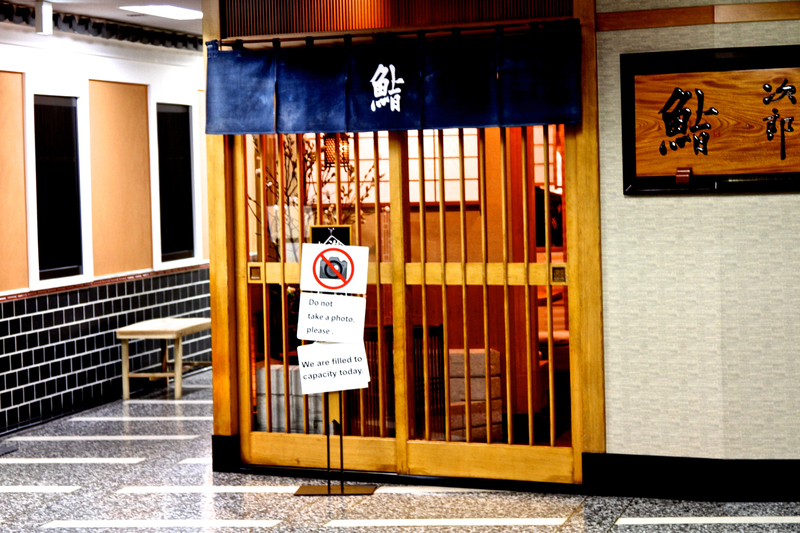 Finally, make sure you specify that you want to go to the original Ginza Sukiyabashi Jiro and not Jiro’s son Takashi’s branch in Roppongi, which is supposedly easier to get into. Armed with our lunchtime reservation, we headed toward Ginza at 1130am. There was no reason for us to leave so early (the ride from our hotel in Mistukoshimae to Ginza was a mere 5 minutes) but we’d checked out, stowed our luggage and succeeded in depriving ourselves of breakfast other than a small bite from Gontran’s. 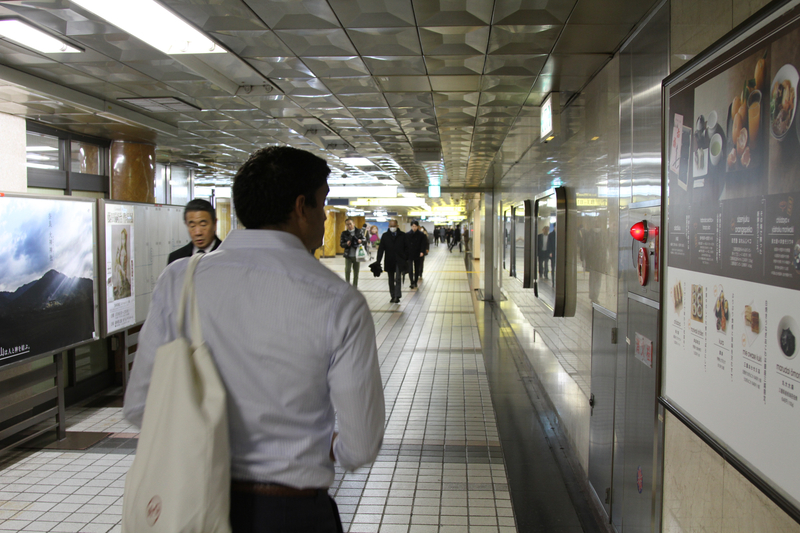 We walked through Ginza station in a bit of a daze; I was giddy with excitement but also a little nervous. We’d finally be eating at Jiro’s! What would it be like? What would he be like? Would he be nice to us? What if he didn’t like us? (Jiro has attracted his fair share of infamy for being impatient with foreigners.) With all these questions and more swimming around in my head, I didn’t know whether to do a happy dance or frantically try and memorise more Japanese phrases. Watashi wa sebete o taberu. I eat everything. We killed some time browsing through the tiny boutiques in Ginza station until finally, it was time to walk through the nondescript glass doors in section B1. You could be forgiven for thinking this is a dead end, by the way. It’s all terribly corporate and uninspiring. There’s no signage and the doors open into a dull elevator bank. When you turn the corner, however, the silhouette of Jiro’s tiny restaurant is unmistakeable: it stands out like a zen oasis in an desert of concrete nondescriptness. A prominent sign at the door prohibits photographs and advises against walk-ins. Other than that, there’s nothing announcing your arrival at a sushi Mecca. 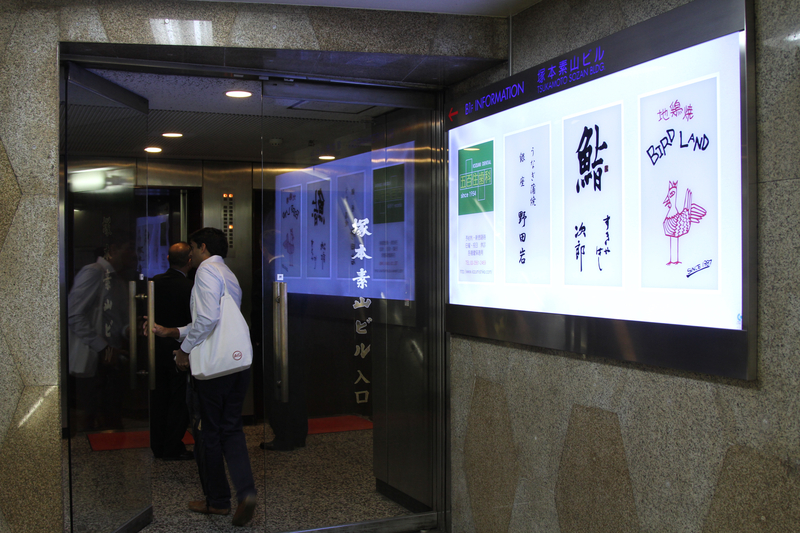 We were met at the door by one of Jiro’s apprentices, who told us they were fully booked. We nodded “We have a reservation for 1230”. He pulled out a notepad and scanned it “Javeri?”. Once he’d confirmed who we were and the name of our hotel, he told us to come back in ten. I suppose we were a bit eager. Fast forward and we were standing inside the cubby hole that separates the inner sanctum of Jiro’s world from Ginza station. The same apprentice took our coats and handed them to a a tiny old lady sitting at an even tinier desk, ushering us through. Stepping into Sukiyabashi Jiro can only be described as surreal. It was as if we’d entered some sort of alternate universe: this warm, cosy little spot in the middle of a bustling station, it felt so strangely familiar. It looks exactly like it does in the movie. 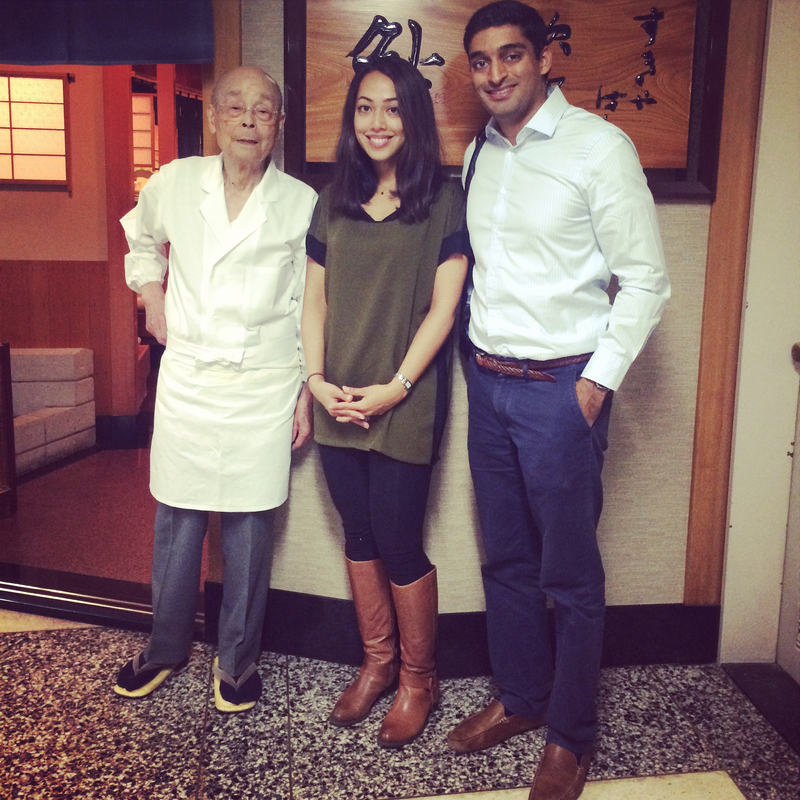 And standing behind the bar was Jiro Ono himself, flanked by his eldest son Yoshikazu and an apprentice. He wore a simple white smock and that familiar inscrutable expression that belies the passion he has for his craft. We were led to one of three booths to sit and wait; another party had just finished their sushi and were sitting nearby, enjoying what appeared to be Jiro’s famous musk melon and green tea. We waited for all of 5 minutes before the apprentice reappeared and asked what we’d like to drink. Spying the 7D, he also said “no pictures please”. He told us it was fine to take pictures of the sushi though. Once Jiro was ready, we were led to the two seats at the end of the bar, giving us a headlong view of all the action. We were also now the only ones in the restaurant, sweet! Hot towels and a bottle of saké appeared promptly and we glanced down to see we each had a printed menu listing the day’s omakasé, with the names of the fish in English. Jiro’s apprentice reappeared, this time on the other side of the bar, and asked if we ate everything. I’d been rehearsing for this moment all morning but now that it had arrived, I blurted out a simple “Hai!”. From here on out, it was the Jiro show. 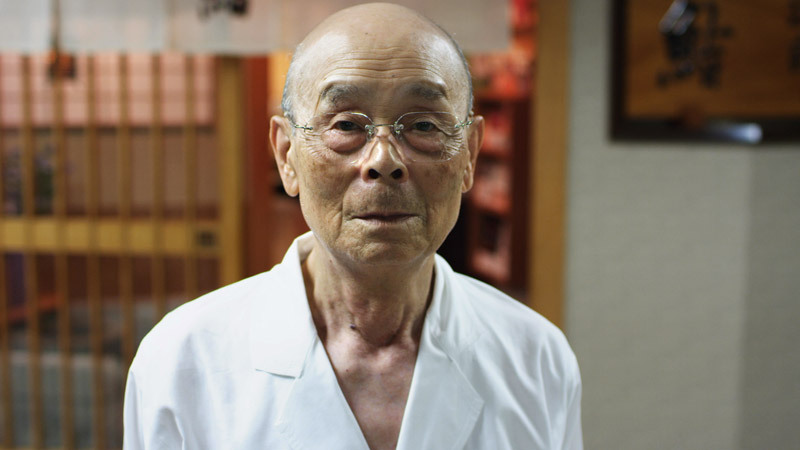 The 89 year old master shaped every piece of sushi himself. He stood in the centre of the tiny bar, Yoshikawa, his now 54 year old son, to his right; the same apprentice and defacto translator, to Yoshikawa’s right; the three of them forming one seriously talented assembly line. An assembly line so masterful, that it churned out piece after piece of perfect sushi, and in record time too. Jiro walked over to deliver each masterpiece to us himself. He’d deposit his creations onto our plates, always mine first, always with a little flourish. Then he’d walk back swiftly, resuming his position at the head of the assembly line and moving on to the next task. We scooped up his masterpieces with reverence, foregoing the chopsticks, in favour of a firm, two-fingered grip. As I opened my mouth, ready to welcome the morsel about to hit my tongue and explode with flavour, I’d occasionally spot Jiro, stealing a glance in our direction, trying to ascertain our satisfaction. I did my best to appear floored, mesmerised, in heaven; it wasn’t hard. Jiro isn’t a tall man; standing side by side, I’ve got a couple of inches on him. Yet, behind that world-famous bar, he appears tall and lean. He moves with the dexterity and confidence of a much younger man, leaving little doubt as to who’s in charge. Still, Jiro is not as brusque and stand-offish as some might make him out to be. At 20 odd minutes for 19 pieces of sushi, the meal is fast-paced for sure and, if you allow for the indulgence of a 1-2 photos per course, it can certainly feel rushed. However, Jiro at no point expressed the sort of impatience or hostility that reviewers like Andy Hayler have complained about. In fact, at one point, after using my chopsticks to pick up a sliver of ginger, I set them back down askance. Jiro immediately noticed and after depositing his latest creations onto our plates, picked up my delinquent chopsticks and returned them to their rightful place — parallel to the line of the table and resting on their ceramic holder rather than pointed toward the chef. I winced, vaguely aware that I’d broken some sort of cardinal chopstick rule and managed to offend this grand master. He picked up on my sheepishness and in a moment of hilarity, put his hands on his hips and glowered at me in mock anger before erupting into peals of laughter. Watching this 89 year old man clutch his stomach and rock with giggles was one of our favourite parts of the meal. The hirame appeared promptly at 12.29. Pearlescent, perfectly shaped, bite-sized (Jiro gave me the “lady portions”), it was soft and luscious and lightly glazed with soy sauce. One of the first things that stood out was the rice; it was noticeably more vinegary and felt closer to room temperature. In any case, it paired beautifully with the hirame. Hirame, usually translates to English as “fluke” or “summer flounder” but was described on Jiro’s menu as “sole fish”; I figured it was a remnant from times when Jiro opened with Karei (winter flounder). Next up was the sumi-ika or squid, which came out also at 12.29. I’ll be honest, I’ve never really enjoyed squid sushi, it’s often chewy and tough and a weird kind of sticky. All that changed in Japan though and after a few nice sushi meals, I was actually looking forward to Jiro’s squid. 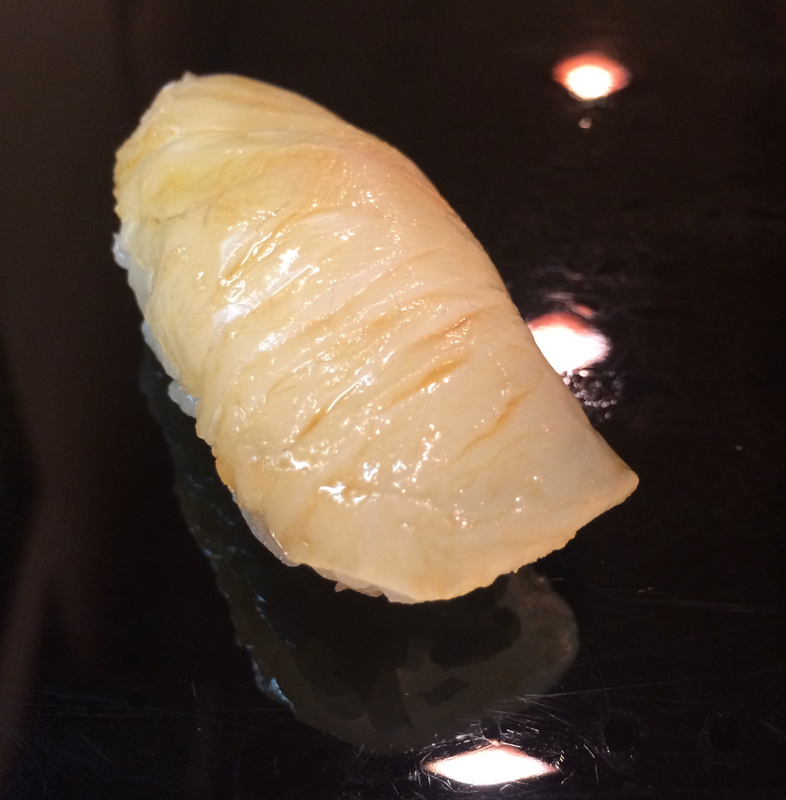 Jiro hadn’t embellished his squid with that trademark crisscross pattern, yet the flesh was tender and uncharacteristically unchewy with a clean bite. 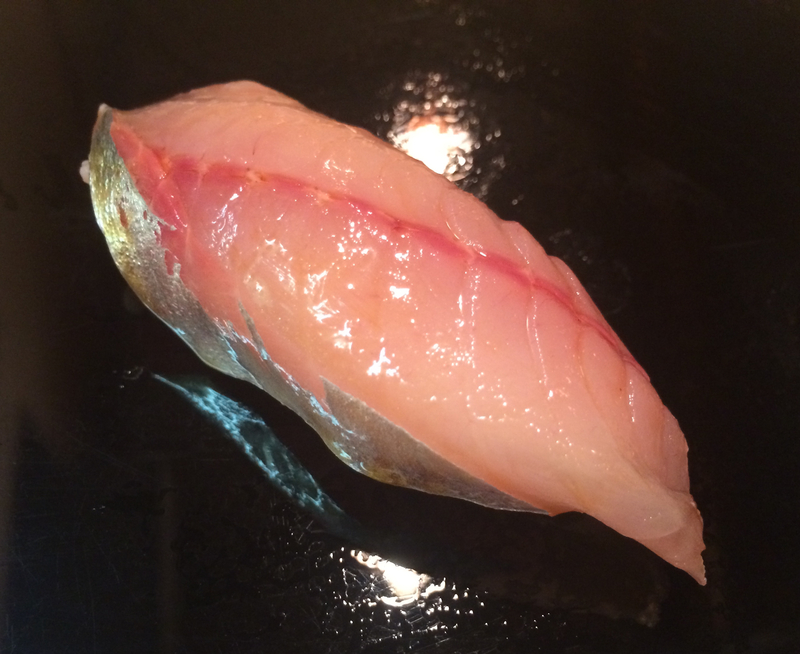 Inada, a form of yellowtail appeared next, at 1230. “Yellowtail” is a bit of a misnomer or, at the very least, an umbrella term, as the taste of the fish varies quite a bit based on age and size. 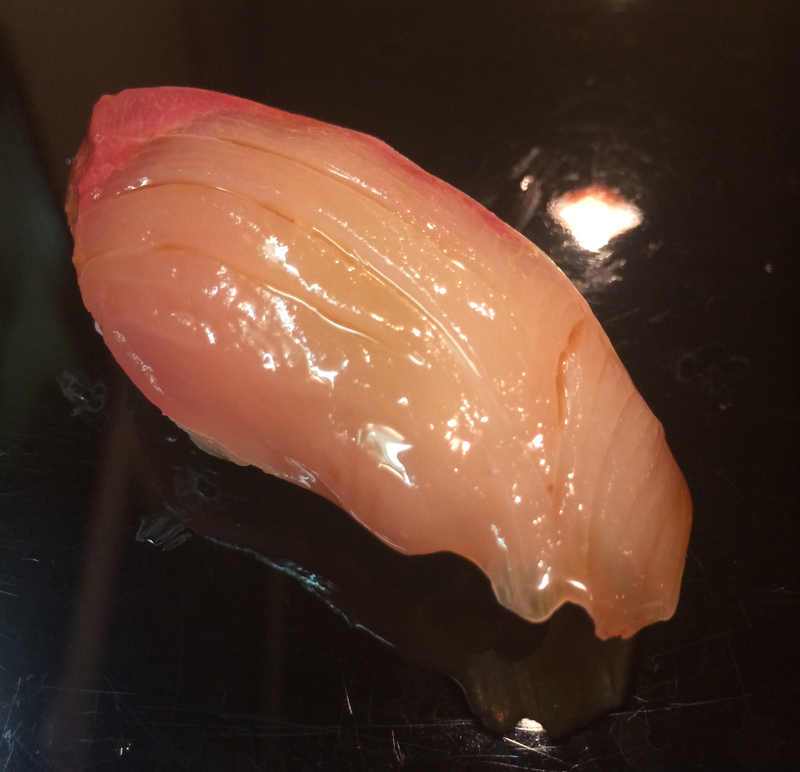 “Inada” is usually reserved for farmed yellowtail that is less than a year old and therefore still soft and fatty, like this piece. The next act was a trio of tuna. At 12.31 came the akami, followed by the chu-toro at 12.32 and and finally the oo-toro at 12.33. Each piece was uniquely delightful and the tro formed a beautiful crescendo in taste, texture and colour. The marbleised finalé of melt-in-the-mouth tuna belly paired perfectly with the vinegary rice and wasabi, and may have spoiled me for good. At 12.34 came the kohada or Gizzard Shad, a fish that appears to be extremely popular in Japan and yet one I hadn’t encountered before the trip. 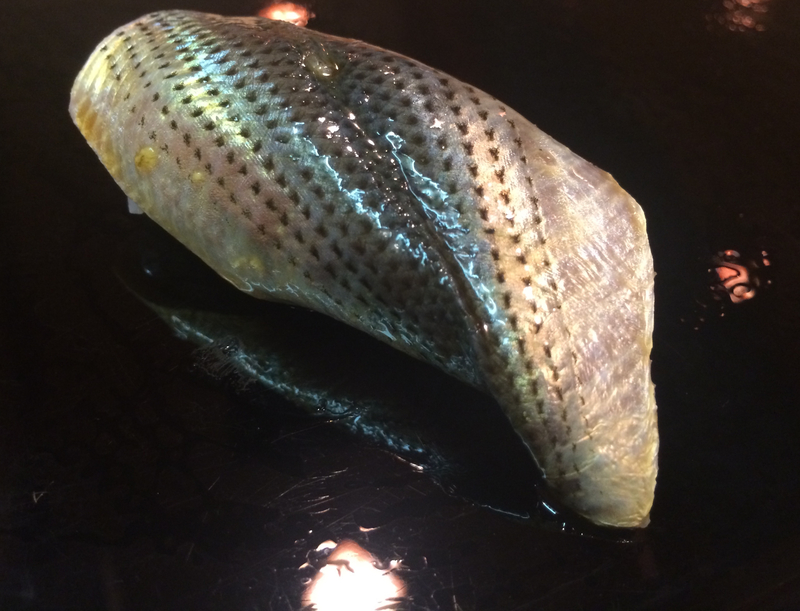 Kohada is served with the skin intact, lending a strong fishy smell and taste to the nigiri. Normally I’d be a little turned off by the overwhelming fishiness of it all, but the skin also makes for a mesmerising display of colour that reminds me of the inside of a conch. 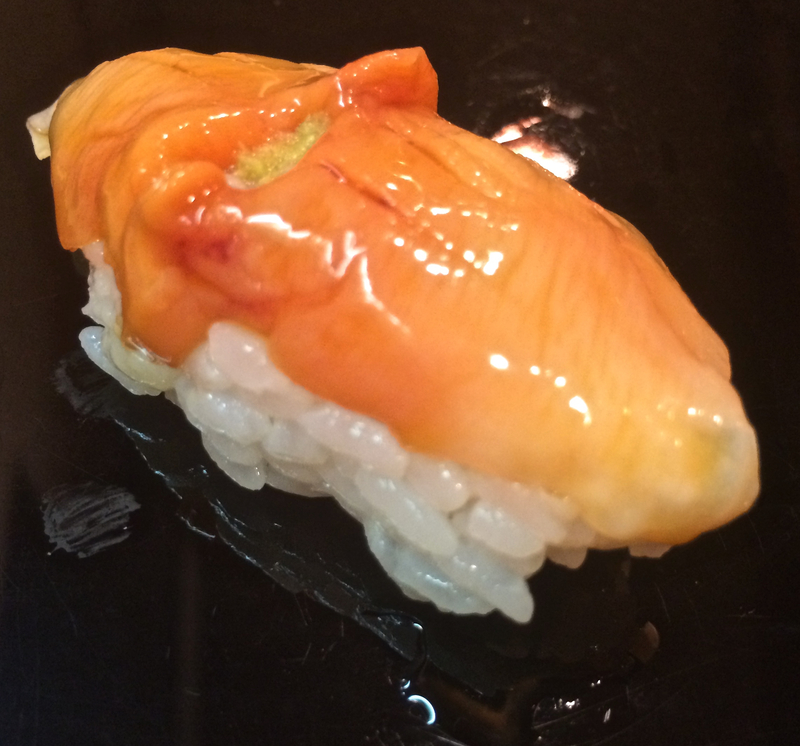 Jiro’s light soy glaze added to the shine and I found myself staring at it a moment before popping it into my mouth. The kohada was followed by Jiro’s famous tako, or octopus at 12.35. As he presented the nigiri on my plate, I couldn’t help but think of the movie and of one his apprentices having to massage the poor octopus for 45 long minutes. Unlike the fish nigiri, which arrived with a glaze of soy sauce, Jiro’s tako was served with a simple dusting of salt. As with most nice sushi restaurants, at Sukiyabashi Jiro, you needn’t bother creating a soup of wasabi and soy sauce or worry about dipping your sushi in said soup without the rice falling apart. Jiro adds what he considers the appropriate amount of wasabi to every single piece of sushi; he then garnishes it with the appropriate glaze of soy sauce, sprinkle of salt or brush of nitsume. Each piece arrives on your plate ready to eat. High on the heels of the tako, at 12.35 came the akagai. 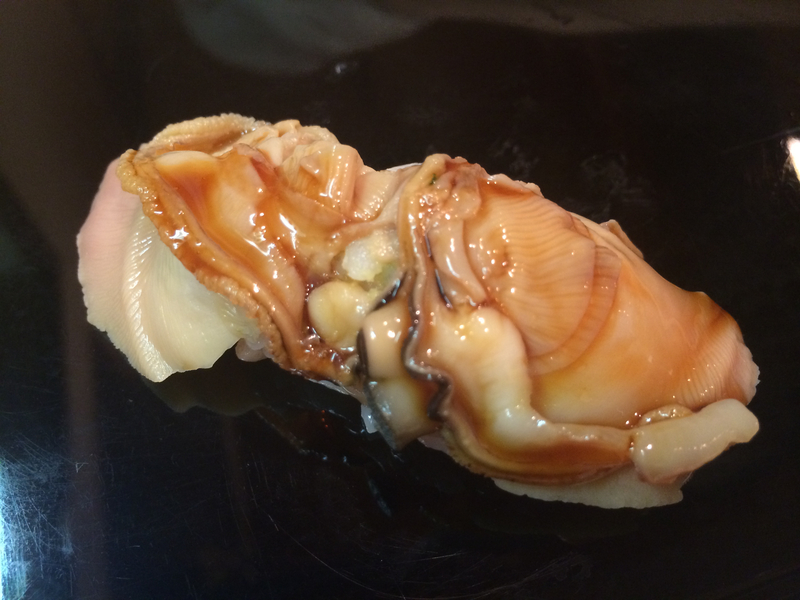 The arc-shell clam (or surf clam) is another specimen that’s less visible on omakasé menus outside of Japan. The akagai is beautifully presented, butterflied and gleaming with a visible dollop of wasabi that looks looks larger than I’d imagine was applied to previous courses. Of course the wasabi hits you with the very first bite, a slight distraction from the slightly chewy, rich flavour. The theme of stronger flavours continued with the aji (horse mackerel) at 12.36 and the hamaguri (common hard shelled clam or Orient clam) at 12.38. The aji was yet another beautiful specimen, slightly fishy, yet delicious. The hamaguri, on the other hand, looked like some sort of alien species; it was beautifully butterflied and glazed with a sweeter sauce. The final act in the stronger flavoured series was the saba or mackerel, which appeared at 12.39. Mackerel spoils easily so it’s typically cured in salt for 3-4 hours and then washed with rice vinegar before filleting for sushi. 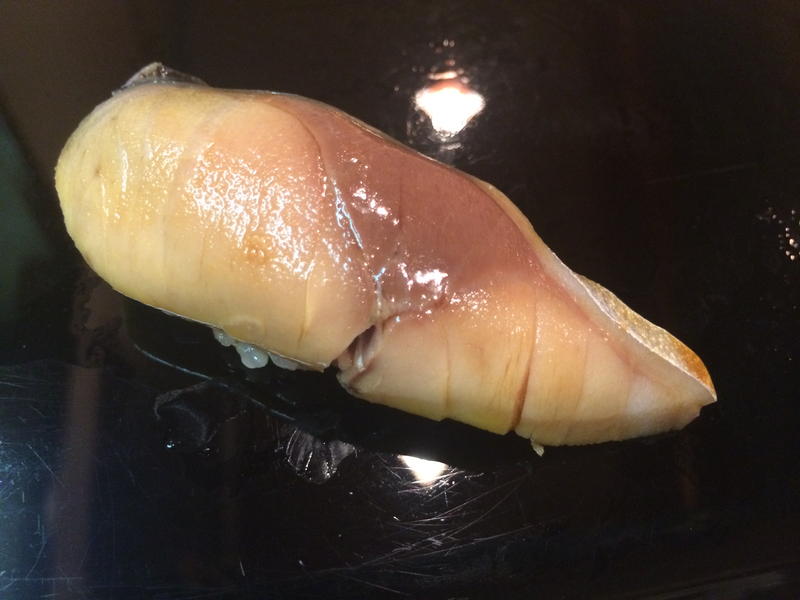 Jiro serves his mackerel with a tiny sliver of skin and it’s perfectly tender with a hint of the ocean. 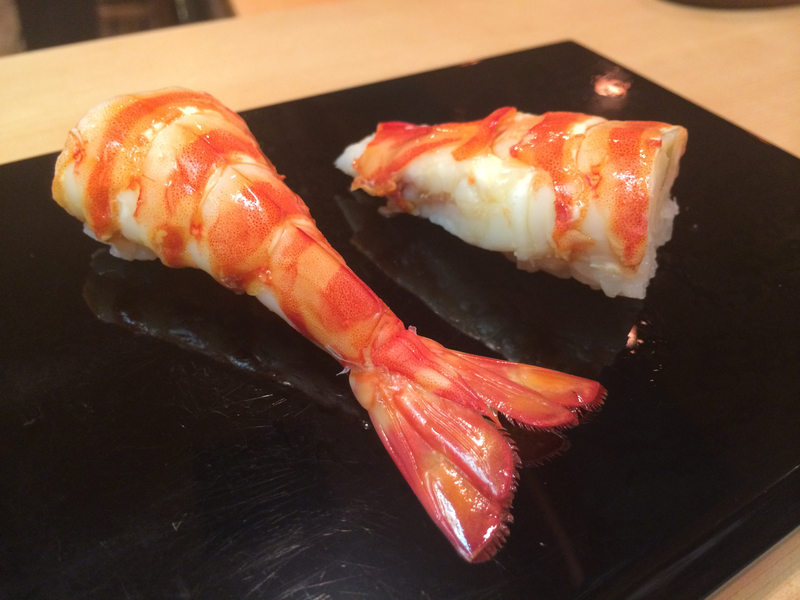 Finally at 12.40 came the kuruma-ebi (giant tiger prawn or Japanese imperial prawn) which, to my relief, was served in two pieces without the head and the “brains”. Fresh as can be, the prawn is boiled immediately after killing and then expertly sliced in a manner that is said to incorporate the taste of the head. Now at this point, I have to note, I began to feel rather full. And this was despite eating at Jiro’s rapid pace (apparently it takes around 20 minutes for your stomach to signal that it’s full, hence why Jiro aims to conclude the meal in that timeframe). As spectacular as the ebi looked, I was reluctant to eat both pieces and would have preferred to eat it sans rice (it’s served without any sort of glaze, which makes it a little dry). I think Jiro’s apprentices must have picked up on my hesitation as he promptly appeared and asked if the portions were the right size for me (“we’ve been giving you the lady sizes, is that fine?”). I nodded appreciatively and smiled. I wondered if they’d give me even smaller portions now. The sayori or needlefish, came out with a slight delay at 12.42 (yes, I just described 2 minutes as “a slight delay”). 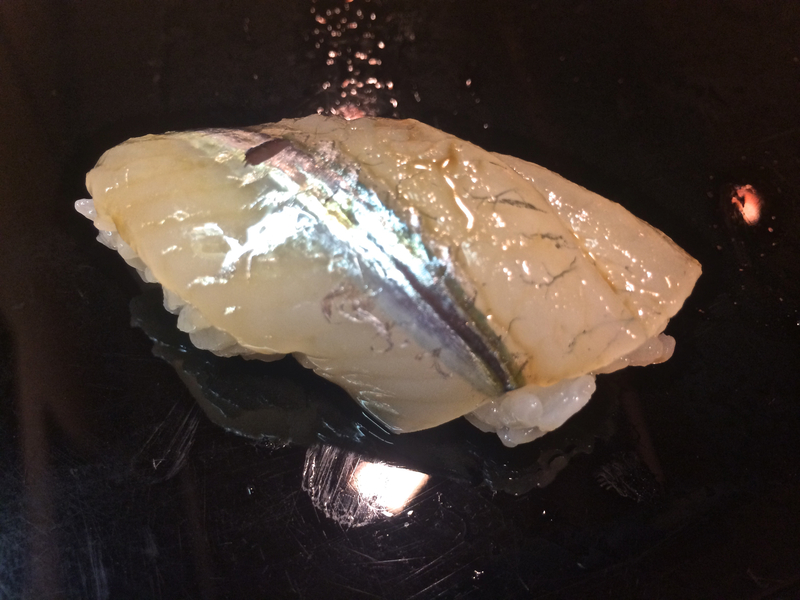 Needlefish, is another example of sushi that’s relatively uncommon outside Japan; it’s flavour leans towards the milder side and the cut itself was beautiful. After the Sayori, began what I like to think of as the extended dessert course — a series of indulgent pieces characterised by rich textures, creamy flavours and balanced sweetness. 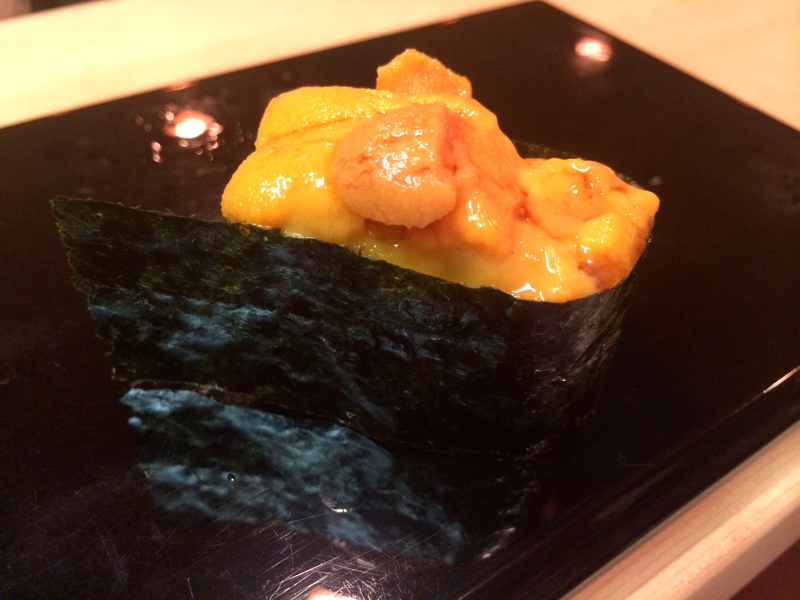 First up was the uni (12.43) which Jiro presented atop the standard cylindrical tower of rice, encased with crisp seaweed. Interestingly, the end of the seaweed wrap was left unhinged, almost as a nod to careful carelessness. It made me all the more nervous about picking up the quivering pile of uni and fitting it into my mouth without mishap. The uni was, of course, delicious. 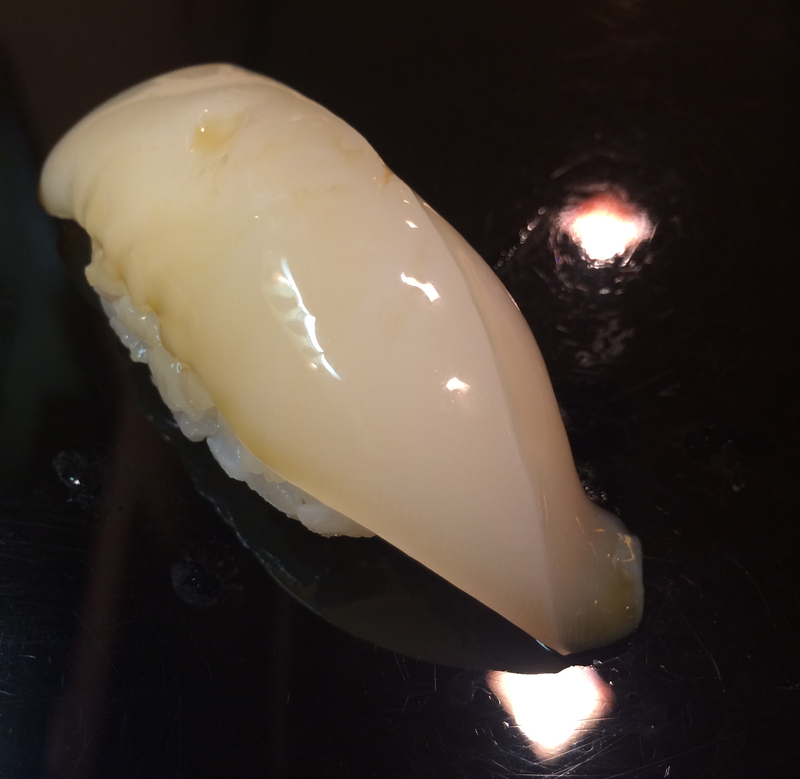 Next (12.44) was the kobashira (baby scallops): tender, silky and subtly flavourful. As with the uni, Jiro left the end of the seaweed deliberately untucked. Is this his trademark thing? 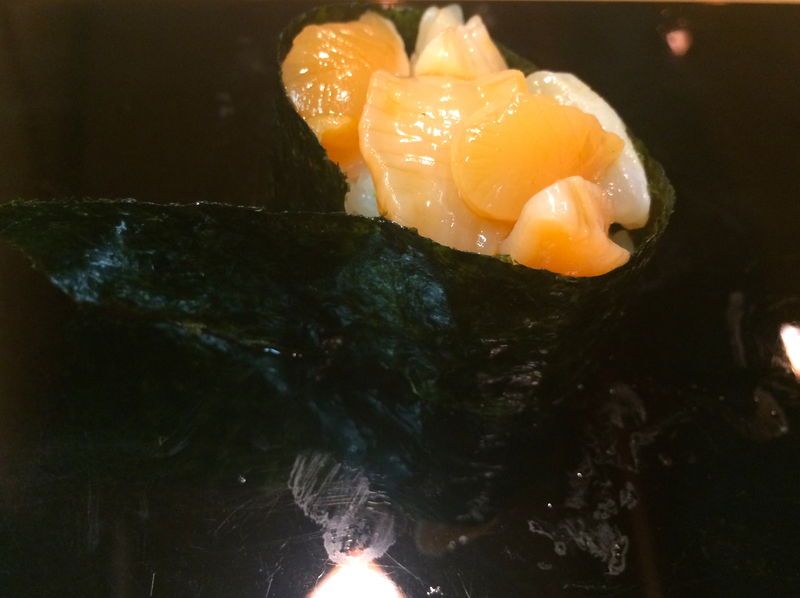 The third (12.45) in this trio of seaweed wrapped delicacies was the ikura (salmon roe). Ikura is another thing I usually pawn off to my companion diner (most often my husband). It’s not really my thing. 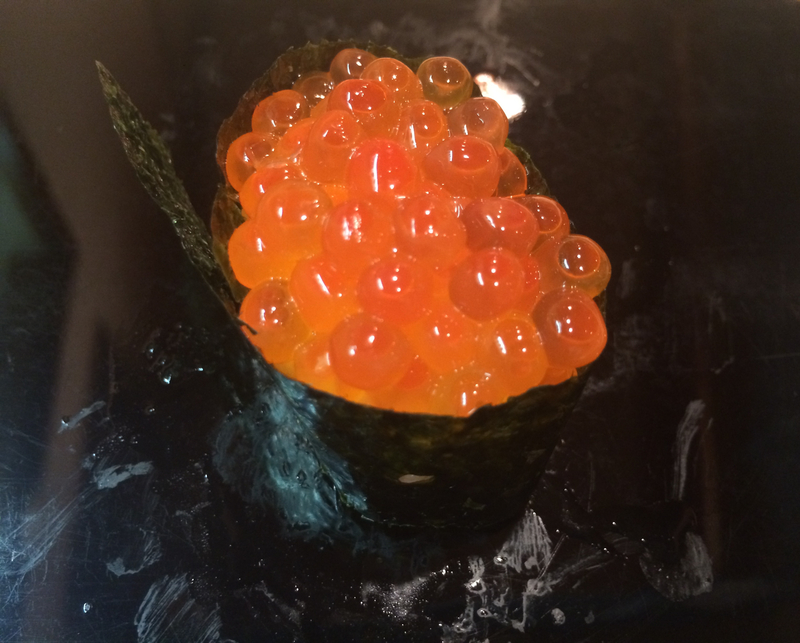 Anyway, Jiro’s ikura was rich, fresh and kind of fun. I enjoyed the sensation of popping bubbles as I chomped down on this one. And with that, it was time (12.47) for the last piece of fish: the sea eel. 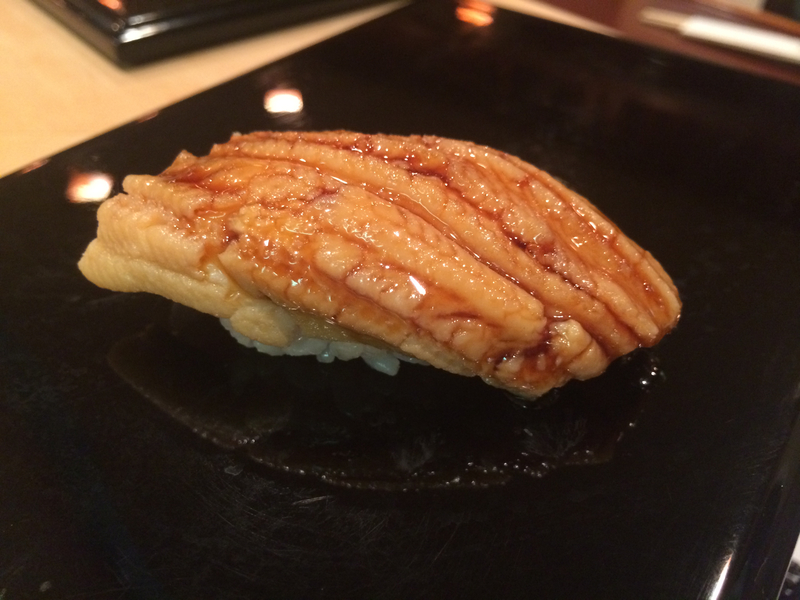 Anago has grown on me while in Japan and I was looking forward to its firmer, more meaty taste, glazed with sweet sauce for the finish. Jiro did not disappoint and though full, I happily devoured this as well. 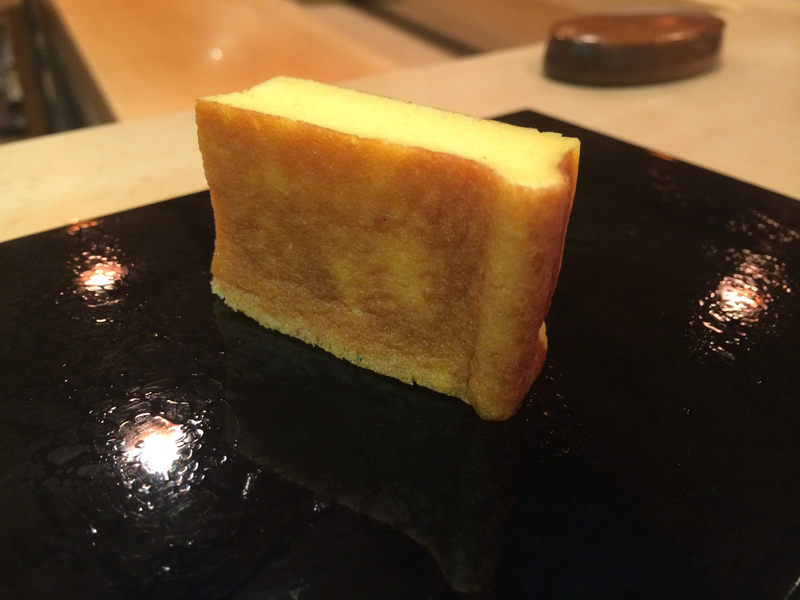 And finally, the pièce de résistance, the tamago, arrived (12.48). I’d been looking forward to this all day and I was hopping in my seat when it arrived. I took a tiny bite and was not disappointed. It was firm but springy, delicately sweet and utterly un-egg like. It was also bigger than I’d expected and I nibbled on it for quite a while. Delicious! After that interlude, we were guided back inside and seated at the same booth we’d initially waited at, except this time a thick slice of Jiro’s famous musk melon and some green tea awaited us. 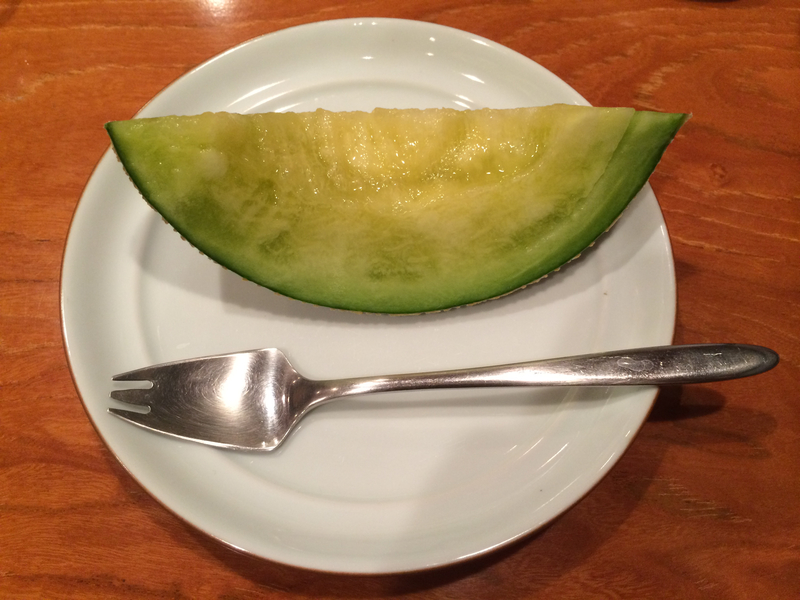 Musk melon is something of a delicacy in Japan; based on what I saw at Tokyo’s luxury department store food courts, a single melon can retail for close to US$100. Jiro’s apprentice also brought our saké over and we sipped hot and cold as we tucked into the incredibly juicy, melony goodness, with..a spork! We lingered over this last part, so much so that Jiro’s next party arrived — a group of distinguished looking locals, a woman and two men. They must have been regulars because Jiro and Yoshikawa gave them a long bow along with some deferential words, which they returned before taking their seats at the centre of the bar. The last pour of our saké, the legendary Daiginjo Tokusei Gold, yielded a delicate gold leaf shaped like a cherry blossom. This was a beautiful touch on top of a saké that was already light, clean and refreshing. If you’re interested in trying it, not only does it retail for less than $10, but you can order it online right now. It’s also the only saké offered at Jiro’s. Once we’d finished up, it was around 1.10pm. We settled the bill in cash (they do accept card now), were helped into our coats by Jiro’s apprentice and accompanied outside. As we walked away, we glanced backward to see the same apprentice standing outside, not in a low bow as Sawada had left us, but with his head low and his hands behind his back, respectful but reserved. Eating at Jiro’s was a dream come true. Watching the 89 year old sushi master work his magic was riveting, knowing he was creating piece after piece of divine sushi solely for us was surreal. We were the only ones at the bar at 1230 and for that brief half hour, we had Jiro all to ourselves. (Jiro seems to prefer serving only one party at a time, something we noticed with the people before us and the ones right after.) So was it worth the hype? Well, if it’s any indication, I’d love to go back. The sushi really was spectacular and Jiro himself was incredible. The fact that this tiny man, who has been making sushi since he was 9 years old, is now approaching his 90s, and is still operating at his level is simply mind blowing. 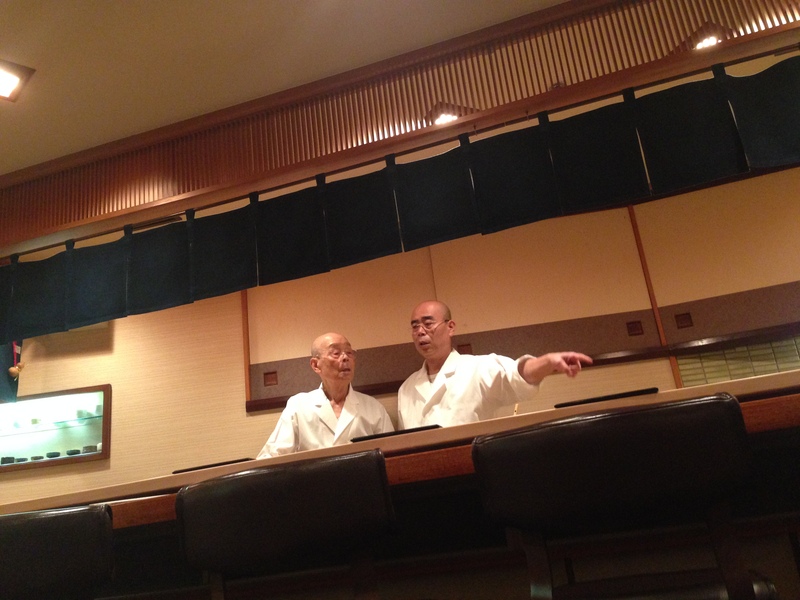 I think it’s worth eating at Sukiyabashi Jiro just to behold Jiro’s passion, persistence and commitment to perfection. I’d also like to return and enjoy the experience without worrying about photos or taking in every small detail. Sukiyabashi Jiro was not my favourite meal in Japan (that honour is reserved for Sushi Sawada) but it was, without a doubt, one of the most incredible dining experiences of my life.